The Partido Popular (PP - People's Party) was established in 1989 during the 9th Congress (Refoundation Congress) of the Alianza Popularœ (AP - People's Alliance), a conservative party founded in 1976 by Manual Fraga (1922-2012; known as "The Last Francoist"). To challenge the absolute majority of the Partido Socialista Obrero Español (PSOE - Spanish Socialist Workers' Party), the PP took distance from its Francoist roots and appointed new, younger leaders; during the 10th Congress, held in 1990, José María Aznar (b. 1953) was elected President while Francisco Álvarez-Casco (b. 1947) was elected Secretary General. The raise of the PP initiated a bipartite system in Spain. The PP won the general elections in 1996 (6th Legislature) and set up an alliance with three nationalist parties: Convergència i Unió (CiU - Convergence and Union - Catalonia), Partido Nacionalista Vasco (PNV - Basque National Party) and Coalición Canaria (CC - Canary Coalition) to form the Aznar I government; in 2000, the PP obtained the absolute majority of the votes and formed the Aznar II government. The PP lost, against all odds, the 2004 elections to the PSOE; the ill management of the aftermath of the bomb attempts of 11 March 2004, which were hastily imputed by the government to the ETA, was among the reasons of the defeat of the PP. The PP returned to the power in 2011 after having won the absolute majority of the votes in the general elections. Mariano Rajoy (b. 1955), who had succeeded Aznar as President of the party in 2004, was appointed Prime Minister of the Rajoy I government. In 2015, the PP won the general elections but could not form a majority; new elections held in 2016 allowed the party to form the Rajoy II government. The Gürtel case revealed a huge system of institutional corruption set up by officials from the PP and businessmen in 1989; in May 2018, 29 out of the 37 charged individuals were convicted to 15 to 51 years in jail. On 1 June 2018, Rajoy was ousted by a vote of no confidence and succeeded by Pedro Sánchez (b. 1972), from the PSOE. Accordingly, Rajoy resigned from the PP direction and was succeeded by Pablo Casado (b. 1981). The flag of the Madrid branch (photo, photo, photo, photo) of the PP is blue with the party's logo and the writing "MADRID" in white letters, placed beneath the logo. The PP unveiled its new logo in July 2015. Pablo Casado presented it as "a more legible logo, with our acronym and emblem, and the albatross or seagull integrated in a circle that emphasizes the central orientation of the party". The logo was designed by the campaign staff led by Jorge Moragas. The new shade of blue is much darker than in the former logo. The typeface is Gotham, already used by the PP, and the talisman of all political parties since it has been used by Obama in his first election. Until 2015, the PP used a blue flag with the party's former emblem in white (photo, photo, photo, photo, photo, photo), and, seemingly to a lesser extent, a white flag with a blue seagull and "PP" in orange letters (photo). The acronym of the Partido Popular is 'PP' while its logotype includes letters 'PP' surmounted by a symbol representing a seagull with spread wings inscribed in a circumference. This particular design of the logo was adopted during the 16th Congress of the party, held on 20-22 June 2008. Older flags feature the original party's emblem as created by the designer Fernando Martínez Vidal, then President of the PP branches in the Salamanca and Mortalaz districts of Madrid. First designed in 1989, the logo was modified in 1993 and on 10 December 2001 (press release). In 2017, the designer asked "a tern" to be substituted to "a seagull" in the wording of the Statutes, the two birds representing different values. "A tern has a high and free flight, while a seagull is a scavenger, has a low flight and moves among filth. The PP cannot be represented by a seagull, even if some leaders have been moving among filth those years." 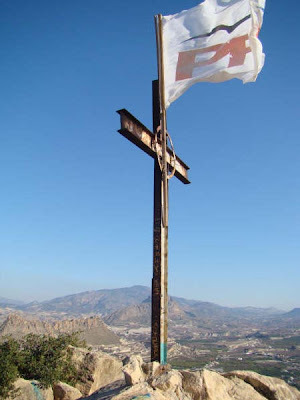 The flag of Nuevas Generaciones del Partido Popular (NNGG), the youth branch of the PP, was white with the emblem of the time. Alianza Popular was founded on 9 October 1976 by Manuel Fraga along with six other former Francoist ministers, who had served as a government minister under Franco and who had expected to play a key role in post-Franco governments. - UNE (Unión Nacional Española, Spanish National Union). The flag of the AP was horizontally divided yellow-red with the party's logo, maode of the red letters "ap" in canton. A new logo (image) was adopted in 1983, which was probably reflected on the flag.